Law enforcement officers are at the residence of former Brownsville Fire Chief Carlos Elizondo. BROWNSVILLE — Law enforcement officers are at the residence of former Brownsville Fire Chief Carlos Elizondo. Lawmen are at the residence trying to serve some type of warrant from the Cameron County District Attorney’s Office on Elizondo, authorities said. 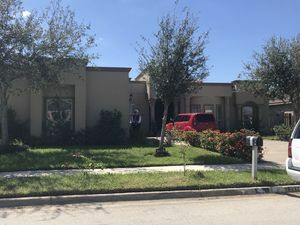 Elizondo is not at the residence and authorities are reportedly waiting for him to return to his home on Vanessa Drive. Elizondo has been named in an audit report conducted by Brownsville City officials, where he is accused of redirecting dispatcher calls to a private ambulance company multiple times. The audit committee reported that an investigation of activities in the fire department and EMS services was launched because of allegations that a private ambulance service known as Intercity Ambulance Service was operating without a permit — and that particular city officials were allegedly allowing the service to operate without proper approvals.